In the 25 years since her debut on Batman: The Animated Series, Harley Quinn has become one of the most popular superheroes in the world. Originally conceived as the Joker’s girl Friday, she’s grown into her own captivating character, and her plucky, IDGAF attitude has made her an idol for readers who want to see more self-assured female characters who play by their own rules. DC Comics is celebrating this milestone for Harley Quinn by making her the focus of this year’s Batman Day (Saturday, September 23), and this week, readers can pick up the Harley Quinn 25th Anniversary Special, a one-shot featuring a star-studded line-up of creators telling Harley Quinn stories. 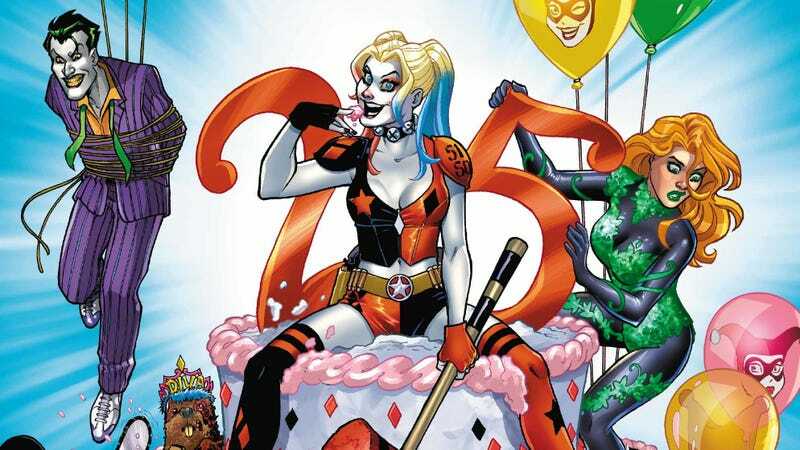 This exclusive preview of Harley Quinn 25th Anniversary Special features excerpt from all four tales, beginning with the regular Harley Quinn writing team of Amanda Conner and Jimmy Palmiotti recounting Harley’s time in Las Vegas with Poison Ivy and Catwoman. Conner is also contributing art for this story, and these preview pages showcase the comedy skills that make her one of the top humorists in comics. Her characters are full of expression, she has impeccable comic timing, and this excerpt spotlights her detailed environmental design and exciting action storytelling. Harley’s creator Paul Dini writes a short for the ongoing Harley Quinn art team of Chad Hardin and Alex Sinclair, and Dini’s takes on Harley and The Joker capture their voices on Batman: The Animated Series and remind readers where their relationship started. The spirit of the classic TV show is also channeled in the story, written by the Howard The Duck team of writer Chip Zdarsky and artist Joe Quinones. In their tale, Harley and Joker are once again trying to wipe out Batman and Robin. Quinones does remarkable work incorporating the look of the cartoon into his own art style, and this dysfunctional duo is the perfect pair for Zdarsky’s DC Comics debut. Finally, Daniel Kibblesmith of The Late Show With Steven Colbert and Valiant High writes a timely story about Harley and Ivy meeting Swamp Thing during a hurricane, and artist David LaFuente highlights the chaos surrounding the two women as they calmly make their way through a supermarket. These are all creators that know how to use the comics form to create hilarious comedy, making Harley Quinn 25th Anniversary Special a must-read for fans of the titular character.